Video abstract presented by Wei Chen. Abstract: Vagus nerve stimulation (VNS) shows long-term efficiency worldwide in most pharmacoresistant patients with epilepsy; however, there are still a small number of patients who are non-responders to VNS therapy. It has been shown that VNS treatment outcomes for drug-resistant epilepsy may be predicted by preoperative heart-rate variability measurements and that patients with epilepsy with ictal tachycardia (IT) during seizures have good responses to VNS. However, few studies have reported the efficacy of VNS in patients with epilepsy with ictal bradycardia (IB) or normal heart rate (HR), and none have explored the possible mechanisms of VNS efficacy based on different HR types. HR during seizures varies, and we presume that different HRs during seizures may impact the effects of VNS. It has been shown that blood pressure in the human body needs to be maintained through the arterial baroreflex (ABR). VNS efficacy in patients with epilepsy with IT, IB, and normal HR during seizures may be related to ABR. Mechanical signals generated by VNS are similar to the autonomic nerve pathways and, thus, we propose the hypothesis that different HRs during seizures can predict VNS efficacy in patients. If VNS is highly efficient in patients with IT during seizures, VNS in patients with a normal HR during seizures may be less efficient, and may even be inefficient in patients with IB during seizures. Epileptic seizures can lead to changes in autonomic functions affecting the sympathetic, parasympathetic, and enteric nervous systems. Changes in cardiac signals are potential biomarkers that may provide an extracerebral indicator of ictal onset in some patients.6 Therefore, preoperative cardiac rhythm abnormalities induced by epileptic stimulation may affect the efficacy of VNS. A previous report has shown that heart-rate (HR) changes can precede clinical and encephalographic seizure onset, and early detection of these changes can have an application in seizure-detection systems.7 Our recent work has also suggested that ictal HR increases occur in 91.36% (74/81) of patients with epilepsy, that HR increases rapidly within 10 seconds prior to seizure onset and typically slows to normal rate with seizure offset,8 and, therefore, ictal tachycardia (IT) can be a prevalent clinical manifestation during the course of a seizure. Clinical research has shown that the AspireSR VNS system is effective in detecting IT and provides automated on-demand stimulation, and improves the sensitivity and specificity of ictal stimulations.9–11 However, no studies have evaluated whether VNS therapy on patients with epilepsy who have ictal bradycardia (IB) or normal HR may be ineffective or less ineffective than on patients with IT. It is very important to screen out candidates who potentially will not benefit from VNS to avoid unnecessary, invasive procedures and to improve the overall clinical efficacy of VNS treatments. Therefore, it is imperative to elucidate the potential physiological interpretations of these findings for establishing accurate prognosis following epilepsy treatment. Experimental theory and clinical evidence have demonstrated that blood pressure (BP) in the human body needs to be maintained through the arterial baroreflex (ABR).12 A good response to VNS in patients with epilepsy with IT during seizures may be related to a hypersensitive ABR. Patients with IB or normal HR during seizures may also have responses related to the ABR; however, the sensitivity may be different. Accordingly, we propose the following hypothesis. VNS therapy is effective in patients with epilepsy with IT during seizures, and this efficacy may be associated with a hypersensitive ABR. VNS therapy in patients with epilepsy with IB and normal HR during seizures may also involve the ABR; however, its efficacy may be different due to different ABR sensitivity. Mechanical signals generated by autonomic nerve pathways, such as the aortic depressor nerve, the carotid sinus nerve, and the nucleus of the tractus solitarius (NTS), are similar. Accordingly, we propose the hypothesis that VNS efficacy for patients with epilepsy differs on the basis of HR during seizures: in patients with IT during seizures, it is efficient; in patients with normal HR during seizures, it may be less efficient than in patients with IT during seizures, and it may be inefficient in patients with IB during seizures. Most studies reported the efficacy of VNS and have found a significant improvement in seizure control in a considerable proportion of the implanted patients;2,15,16 however, the efficacy in a limited number of patients has been worse. It is unclear why VNS efficacy is limited in certain individuals, and predictive measurements to identify patients that are most likely to respond to VNS are lacking. Moreover, the mechanism of action of VNS is not fully understood. IB is considered a rare phenomenon, and is thought to be caused by an increase in parasympathetic activity or disruption of sympathetic activity resulting from propagative ictal activity in the respective autonomic cortical or subcortical networks.17 However, it is difficult to predict whether VNS therapy is effective in patients with IB and normal HR during seizures. Considerable research has shown that autonomic alterations during seizures are associated with a variety of cardiac manifestations. These manifestations include changes in HRV, IT, IB, atrioventricular block, and asystole.13 The latest research has shown that patients with IT during seizures demonstrate good responses to VNS therapy,9–11 yet, its mechanism of action in treating epileptic seizures remains unclear. Several theories exist with regard to the therapeutic mechanism of VNS, but it is certain that activation of vagal afferents through electrical stimulation influences seizure-related circuitry within the brain,24 and it is presumed that different HRs during seizures influence activities of parasympathetic and sympathetic effector neurons and GABA, through different sensitivity of the ABR, which may also play an important role. Based on the aforementioned theory, we speculated that mechanical signals originating in patients with normal HR during seizures and those in patients upon activation of vagal afferents through VNS could all possibly play a role to produce responses to VNS therapy. The sensory threshold for arterial pressure is higher than that of the baroreceptor in patients with normal HR during seizures. Changes in BP are sensed by the normal ABR. These mechanical signals are then converted into an action potential frequency, which propagates along X and IX nerves to the NTS in the brainstem, causing an increased parasympathetic (the vagus nerve projection area releases an increasing amount of GABA) and decreased sympathetic drive, which would be manifested as a reflex response to the rise in arterial pressure through a normal ABR, and possibly sufficient to produce VNS efficacy. In addition, activation of vagal afferents through VNS and mechanical signals coming from electrical stimulation propagates to the NTS in the brainstem, causing an increased parasympathetic (the vagus nerve projection area releases an increasing amount of GABA) and decreased sympathetic drive, which is possibly sufficient to ensure VNS efficacy (Figure 1). In a similar way, we speculated that mechanical signals from patients with IT during seizures and those from patients upon the activation of vagal afferents through VNS all possibly play a role to produce good responses to VNS therapy. The sensory threshold is higher in arterial pressure than that of the baroreceptor in patients with IT, and its sensitivity to the ABR is higher than that of patients with normal HR. Changes in BP are recognized by a hypersensitive ABR. Mechanical signals are then converted into an action potential frequency, which propagates along X and IX nerves to the NTS in the brainstem, resulting in an increased parasympathetic (the vagus nerve projection area releases an increasing amount of GABA) and decreased sympathetic drive, which would be expected as a reflex response to the rise in arterial pressure through a hypersensitive ABR, together with the positive effect of the mechanical signals coming from the activation of vagal afferents through VNS, and further improving the effects of VNS (Figure 2). Conversely, we speculate that mechanical signals from patients with IB during seizures may be insufficient to support the efficacy of VNS. The sensory threshold is lower in arterial pressure than that of the baroreceptor in patients with IB during seizures, and the sensitivity of the ABR is lower than in patients with normal HR. Changes in BP are sensed by a hyposensitive ABR. Mechanical signals are then converted into an action potential frequency, which propagates along X and IX nerves to the NTS in the brainstem, and results in an increased sympathetic and decreased parasympathetic drive (the vagus nerve projection area releases a lesser amount of GABA), which would be expected as a reflex response to the drop in arterial pressure through a hyposensitive ABR, together with the positive effect of the mechanical signals coming from the activation of vagal afferents through VNS, and possibly insufficient to produce VNS efficacy. We further speculate that, if the action potential frequency from patients upon the activation of vagal afferents through VNS is greater than the frequency from patients with IB during seizures, patients with IB during seizures may display a less efficient response than patients with normal HR. Furthermore, if the action potential frequency from VNS is less than the frequency from a seizure with IB, patients with IB during seizures may not respond efficiently to VNS therapy (Figure 3). 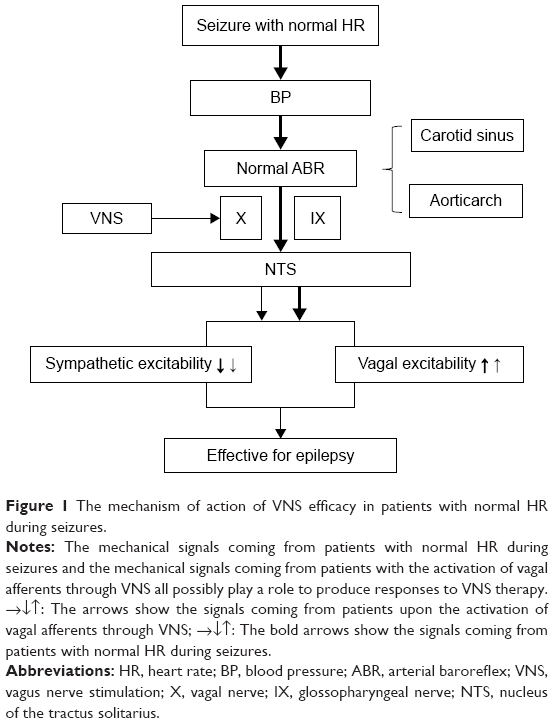 Figure 1 The mechanism of action of VNS efficacy in patients with normal HR during seizures. 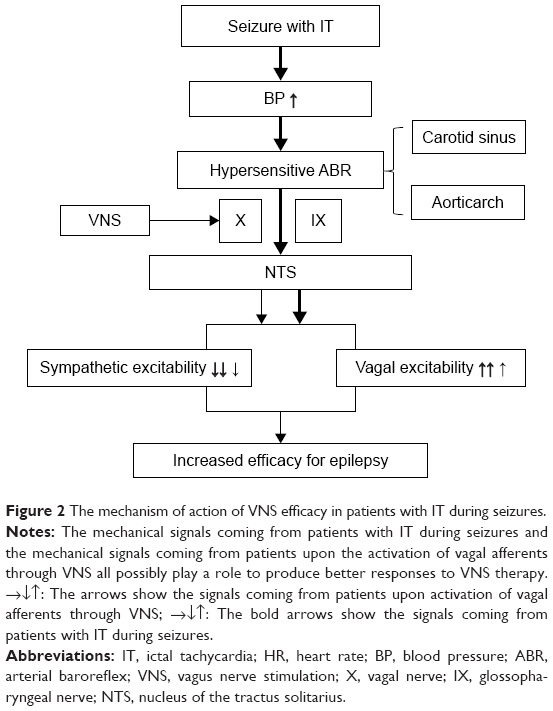 Notes: The mechanical signals coming from patients with normal HR during seizures and the mechanical signals coming from patients with the activation of vagal afferents through VNS all possibly play a role to produce responses to VNS therapy. →↓↑: The arrows show the signals coming from patients upon the activation of vagal afferents through VNS; →↓↑: The bold arrows show the signals coming from patients with normal HR during seizures. Abbreviations: HR, heart rate; BP, blood pressure; ABR, arterial baroreflex; VNS, vagus nerve stimulation; X, vagal nerve; IX, glossopharyngeal nerve; NTS, nucleus of the tractus solitarius. Figure 2 The mechanism of action of VNS efficacy in patients with IT during seizures. Notes: The mechanical signals coming from patients with IT during seizures and the mechanical signals coming from patients upon the activation of vagal afferents through VNS all possibly play a role to produce better responses to VNS therapy. →↓↑: The arrows show the signals coming from patients upon activation of vagal afferents through VNS; →↓↑: The bold arrows show the signals coming from patients with IT during seizures. Abbreviations: IT, ictal tachycardia; HR, heart rate; BP, blood pressure; ABR, arterial baroreflex; VNS, vagus nerve stimulation; X, vagal nerve; IX, glossopharyngeal nerve; NTS, nucleus of the tractus solitarius. 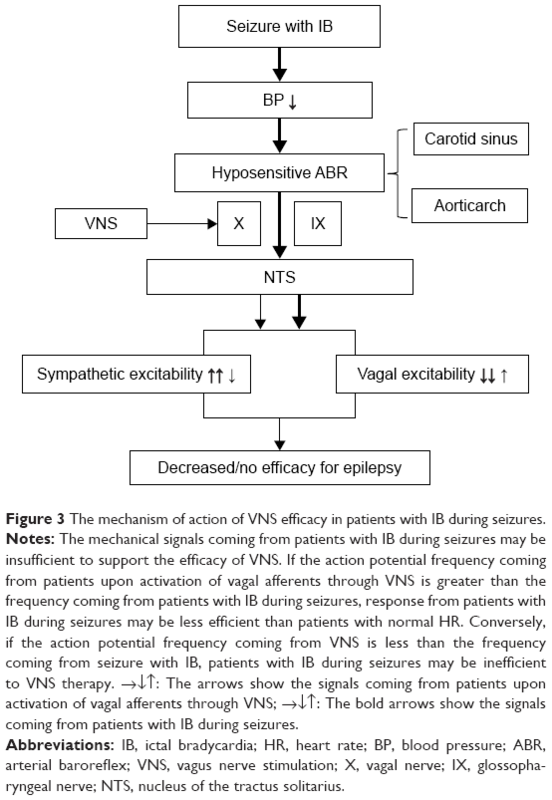 Figure 3 The mechanism of action of VNS efficacy in patients with IB during seizures. Notes: The mechanical signals coming from patients with IB during seizures may be insufficient to support the efficacy of VNS. If the action potential frequency coming from patients upon activation of vagal afferents through VNS is greater than the frequency coming from patients with IB during seizures, response from patients with IB during seizures may be less efficient than patients with normal HR. Conversely, if the action potential frequency coming from VNS is less than the frequency coming from seizure with IB, patients with IB during seizures may be inefficient to VNS therapy. →↓↑: The arrows show the signals coming from patients upon activation of vagal afferents through VNS; →↓↑: The bold arrows show the signals coming from patients with IB during seizures. Abbreviations: IB, ictal bradycardia; HR, heart rate; BP, blood pressure; ABR, arterial baroreflex; VNS, vagus nerve stimulation; X, vagal nerve; IX, glossopharyngeal nerve; NTS, nucleus of the tractus solitarius. It has been shown that patients with epilepsy with IT during seizures have good responses to VNS therapy,9–11 and its treatment mechanism may be related to a hypersensitive ABR. We presume that the treatment mechanism of VNS in patients with epilepsy with IT, IB, and normal HR during seizures all involve ABR with different sensitivities. Mechanical signals generated by the autonomic nerve pathways are similar, which means that the effect and efficacy of VNS in the brain could be inefficient or less efficient in patients with IB during seizures than in patients with normal HR. Most studies to date show the efficacy and safety of VNS; however, a limited number of patients often have poorer efficacy and undesirable side effects. VNS involves the implantation of costly stimulation devices via an invasive neurosurgical procedure, which may result in common side effects such as hoarseness, throat pain, coughing, and skin infection. Occasionally, side effects may be more serious, such as dysphagia and ipsilateral vocal cord paralysis, for some patients. Therefore, screening candidates who may potentially not benefit for VNS therapy remains important to avoid unnecessary invasive procedures and postoperative side effects. VNS therapy may be efficient and can be performed for certain patients with epilepsy with IT and normal HR during seizures, while VNS therapy may be inefficient and not worth undertaking for patients with IB during seizures. As previously mentioned, VNS therapy may be efficient and safe in patients with epilepsy with normal HR and IT during seizures. Even so, there are a limited number of papers reporting late-onset bradycardia during VNS therapy.25 These papers hypothesize that the mechanism of bradycardia-involved mechanical deformation of the vagus nerve resulting in a hypersensitive baroreceptor reflex is manifested by the observed bradycardia. Continual stimulation in this setting can theoretically promote a tendency toward bradycardia. Mechanical stimulation is caused by nerve traction exerted by the stimulator lead.26 Cardiac complications of VNS therapy are very infrequent, but clinicians should be alerted to its possibility. A cardiac evaluation is mandatory before VNS implantation and periodically thereafter. We also hope that clinical randomized controlled trials will be conducted as soon as possible to verify whether our hypothesis is true or false. This study was supported by the Beijing Municipal Commission of Science and Technology (grant number Z161100000516078). Elliott RE, Morsi A, Kalhorn SP, et al. Vagus nerve stimulation in 436 consecutive patients with treatment-resistant epilepsy: long-term outcomes and predictors of response. Epilepsy Behav. 2011;20(1):57–63. Elliott RE, Morsi A, Tanweer O, et al. Efficacy of vagus nerve stimulation over time: review of 65 consecutive patients with treatment-resistant epilepsy treated with VNS >10 years. Epilepsy Behav. 2011;20(3):478–483. Mogul DJ, van Drongelen W. Electrical control of epilepsy. Annu Rev Biomed Eng. 2014;16:483–504. Kim MJ, Yum MS, Kim EH, et al. An interictal EEG can predict the outcome of vagus nerve stimulation therapy for children with intractable epilepsy. Child’s Nerv Syst. 2016;33(1):145–151. Liu H, Yang Z, Huang L, Qu W, Hao H, Li L. Heart-rate variability indices as predictors of the response to vagus nerve stimulation in patients with drug-resistant epilepsy. Epilepsia. 2017;58(6):1015–1022. Eggleston KS, Olin BD, Fisher RS. Ictal tachycardia: the head-heart connection. Seizure. 2014;23(7):496–505. Jansen K, Varon C, Van Huffel S, Lagae L. Peri-ictal ECG changes in childhood epilepsy: implications for detection systems. Epilepsy Behav. 2013;29(1):72–76. Chen W, Guo CL, Zhang PS, et al. Heart rate changes in partial seizures: analysis of influencing factors among refractory patients. BMC Neurol. 2014;14:135. El Tahry R, Hirsch M, Van Rijckevorsel K, et al. Early experiences with tachycardia-triggered vagus nerve stimulation using the AspireSR stimulator. Epileptic Disord. 2016;18(2):155–162. Boon P, Vonck K, van Rijckevorsel K, et al. A prospective, multicenter study of cardiac-based seizure detection to activate vagus nerve stimulation. Seizure. 2015;32:52–61. Hampel KG, Vatter H, Elger CE, Surges R. Cardiac-based vagus nerve stimulation reduced seizure duration in a patient with refractory epilepsy. Seizure. 2015;26:81–85. Lau OC, Shen B, Wong CO, et al. TRPC5 channels participate in pressure-sensing in aortic baroreceptors. Nat Commun. 2016;7:11947. Allana SS, Ahmed HN, Shah K, Kelly AF. Ictal bradycardia and atrioventricular block: a cardiac manifestation of epilepsy. Oxf Med Case Reports. 2014;2014(2):33–35. Hirsch M, Altenmüller DM, Schulze-Bonhage A. Latencies from intracranial seizure onset to ictal tachycardia: a comparison to surface EEG patterns and other clinical signs. Epilepsia. 2015;56(10):1639–1647. Ben-Menachem E, Revesz D, Simon BJ, Silberstein S. Surgically implanted and non-invasive vagus nerve stimulation: a review of efficacy, safety and tolerability. Eur J Neurol. 2015;22(9):1260–1268. Ryvlin P, Gilliam FG, Nguyen DK, et al. The long-term effect of vagus nerve stimulation on quality of life in patients with pharmacoresistant focal epilepsy: the PuLsE (Open Prospective Randomized Long-term Effectiveness) trial. Epilepsia. 2014;55(6):893–900. Velagapudi P, Turagam M, Laurence T, Kocheril A. Cardiac arrhythmias and sudden unexpected death in epilepsy (SUDEP). Pacing Clin Electrophysiol. 2012;35(3):363–370. Levy MN, Pappano AJ. Cardiovascular Physiology. Philadelphia, PA: Mosby Elsevier; 2007. Asconapé JJ, Moore DD, Zipes DP, Hartman LM, Duffell WH Jr. Bradycardia and asystole with the use of vagus nerve stimulation for the treatment of epilepsy: a rare complication of intraoperative device testing. Epilepsia. 1999;40(10):1452–1454. Kalia M, Sullivan JM. Brainstem projections of sensory and motor components of the vagus nerve in the rat. J Comp Neurol. 1982;211(3):248–265. Menétrey D, Basbaum AI. Spinal and trigeminal projections to the nucleus of the solitary tract: a possible substrate for somatovisceral and viscerovisceral reflex activation. J Comp Neurol. 1987;255(3):439–450. Henry TR. Therapeutic mechanisms of vagus nerve stimulation. Neurology. 2002;59(6 Suppl 4):S3–S14. Neese SL, Sherill LK, Tan AA, et al. Vagus nerve stimulation may protect GABAergic neurons following traumatic brain injury in rats: an immunocytochemical study. Brain Res. 2007;1128(1):157–163. Panebianco M, Zavanone C, Dupont S, Restivo DA, Pavone A. Vagus nerve stimulation therapy in partial epilepsy: a review. Acta Neurol Belg. 2016;116(3):241–248. Cantarín-Extremera V, Ruíz-Falcó-Rojas ML, Tamaríz-Martel-Moreno A, García-Fernández M, Duat-Rodriguez A, Rivero-Martín B. Late-onset periodic bradycardia during vagus nerve stimulation in a pediatric patient. A new case and review of the literature. Eur J Paediatr Neurol. 2016;20(4):678–683. Clark AJ, Kuperman RA, Auguste KI, Sun PP. Intractable episodic bradycardia resulting from progressive lead traction in an epileptic child with a vagus nerve stimulator: a delayed complication. J Neurosurg Pediatr. 2012;9(4):389–393.